This post originally appeared on the NDI - DemocracyWorks and OpeningParliament blogs. Since its launch in 2011, many have urged the Open Government Partnership (OGP) to expand beyond narrow definitions of the term “government.” Legislators, mayors, and others argued that OGP’s transformational potential was tied in part to its ability to accommodate different branches and levels of government -- not only the executive, as is the case in many member countries. A truly open government includes an accountable executive branch, trusted legislatures, and responsive governance at all levels. This was an ambitious vision, but many argued that OGP’s ability to deliver better democracy and better governance was tied to its continued growth and expansion. 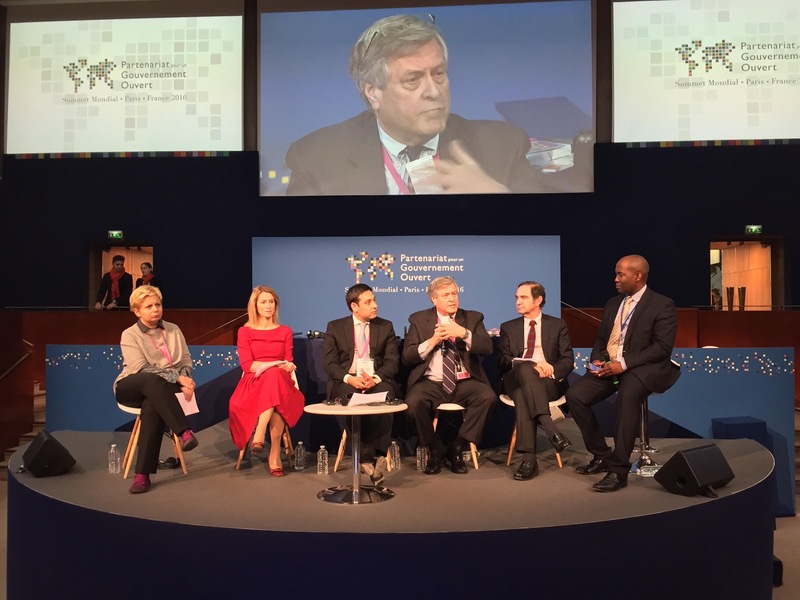 The OGP Summit in Paris, which took place last month and convened hundreds of open government champions and activists from around the world, clearly indicated that OGP is beginning to deliver on this ambitious agenda. This is particularly true with respect to parliaments, which are now an integral component of OGP in many member countries and are helping deliver real reforms at the country level. While the OGP Summit demonstrated that parliamentary openness is a mainstream issue in the OGP community, 2017 provides an opportunity to deliver even more meaningful legislative openness reforms. Advancing the legislative openness agenda has been among OGP’s most important achievements, despite not having been a part of its original design. Numerous parliaments around the world have used the OGP platform to advance openness commitments, while many others have developed parallel processes inspired by OGP principles—such as co-creation with civil society—to develop their own legislative openness action plans. These commitments have called on parliaments to: publish more information about their work, create new avenues for citizen participation in the legislative process, and develop robust ethics systems to manage conflicts of interest and ensure public trust in the legislature. Participation in the Legislative Openness Working Group, which is co-chaired by the Congress of Chile and the National Democratic Institute, has also continued to grow, with parliamentary representatives or civil society activists from nearly every OGP member country participating in Working Group activities. As a reflection of growing interest and demand, the Paris Summit featured a robust legislative openness track, with side events, main conference sessions, and valuable networking opportunities. During the main conference, there were seven sessions on legislative openness issues, covering a broad range of issues from open legislative data, to the creation of “hacker spaces” in parliament, to co-creation of legislation. (Video of the Legislative Openness Working Group’s mainstage panel is available here.) The French National Assembly and Senate also organized side meetings, providing a full day of legislative programming running parallel to the main conference. Legislative programming at OGP events is becoming a well-established norm, with robust legislative tracks at the last two OGP Summits and legislative programming at nearly all OGP regional meetings. Going forward, the Working Group encourages OGP to continue to include legislative programming at forthcoming OGP Summits and regionals events. Of course, the participation of legislatures in the Summit is not an accomplishment on its own. Broad legislative participation in the Summit may reflect increased interest in this issue, but success should be defined by the number and quality of legislative openness commitments developed and implemented. With the recent passage of a legislative engagement policy, the number of legislative openness commitments developed is likely to increase. The new policy outlines more clear rules for legislatures that are interested in developing and implementing commitments through OGP, providing the space for increased parliamentary participation while encouraging coordination between different branches. As the policy was passed in September, “odd year” OGP member countries with National Action Plans due in 2017 are positioned to take advantage of the new legislative engagement policy in the coming months. The Working Group anticipates focusing its efforts in the first half of 2017 on supporting OGP member country governments and legislatures that are interested in including legislative openness commitments in their National Action Plan. Over the coming weeks, the Working Group’s co-chairs will be working closely with all who are interested in shaping the Working Group’s workplan for 2017. The co-chairs intend to heavily support “odd year” OGP countries developing action plans, but will also provide support and opportunities to those countries currently implementing legislative openness commitments. There will also be additional work to provide technical resources in support of legislative openness champions. For instance, new information will continue to be added to the Legislative Openness Data Explorer, a website that compiles crowdsourced, comparative information on legislative openness around the world. The Working Group also intends to organize a global meeting this spring, which will provide another opportunity to convene leaders from around the world to discuss the new legislative engagement policy. Throughout the planning process, the co-chairs will solicit feedback from the Working Group and the broader OGP community, particularly with regards to issues or countries that should be a priority for the coming year. For more information on previous workplans, please see this page. With the passage of the new legislative engagement policy, and building off the momentum generated at the Paris Summit, 2017 promises to be a productive year for OGP’s parliamentary community. By creating opportunities for peer learning and providing technical assistance and advice, the Working Group will support governments, parliaments, and civil society groups as they develop and implement even more ambitious legislative openness commitments. More information about Working Group plans for the coming year will be circulated shortly for comment. As always, please do not hesitate to reach out to the co-chairs.